Mini Mixing Wheel - Gilson Co. Proper sample preparation for materials such as coal or ores requires careful and thorough mixing to assure consistent and accurate results. 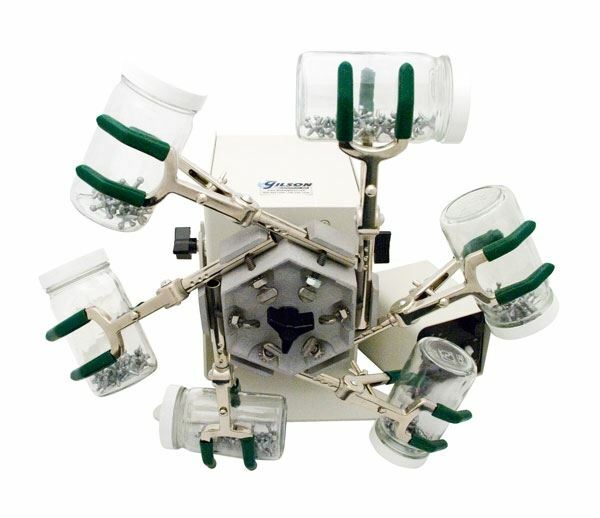 SP-42 Mini Mixing Wheel rotates up to six 8oz (237ml) sample jars over a 10—60rpm adjustable speed range. The large three-finger thumbscrew clamps lock bottles securely at a 45° angle (as specified by ASTM D2013) or other required position. The sturdy bench unit with painted steel frame has resilient rubber feet and includes a 6ft (1.8m) three-wire cord. The cord-attached speed control module permits safe use away from wheel rotation. The continuous-duty motor is adequate to rotate containers with diameters up to the 3.5in (89mm).